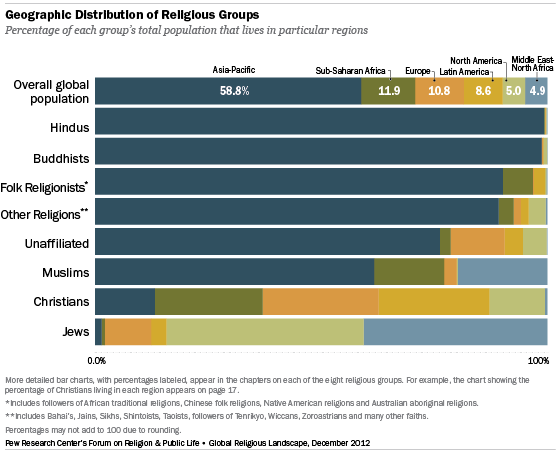 The geographic distribution of religious groups varies considerably. 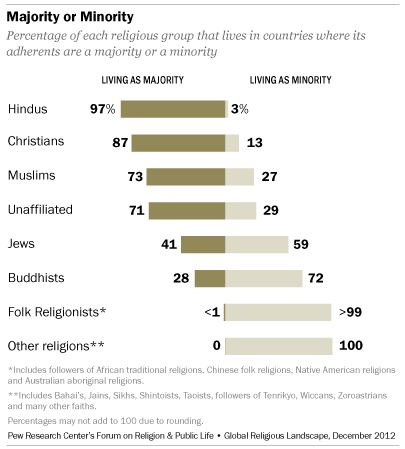 Several religious groups are heavily concentrated in the Asia-Pacific region, including the vast majority of Hindus (99%), Buddhists (99%), adherents of folk or traditional religions (90%) and members of other world religions (89%). Three-quarters of the religiously unaffiliated (76%) also live in the massive and populous Asia- Pacific region. Indeed, the number of religiously unaffiliated people in China alone (about 700 million) is more than twice the total population of the United States. The Asia-Pacific region also is home to most of the world’s Muslims (62%). About 20% of Muslims live in the Middle East and North Africa, and nearly 16% reside in sub-Saharan Africa. 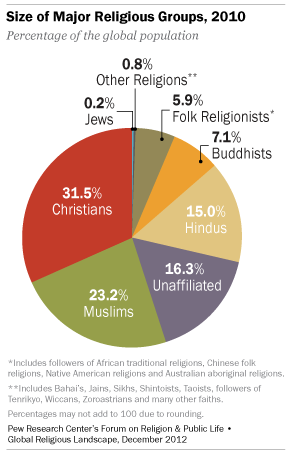 Of the major religious groups covered in this study, Christians are the most evenly dispersed. Roughly equal numbers of Christians live in Europe (26%), Latin America and the Caribbean (24%) and sub-Saharan Africa (24%). A plurality of Jews (44%) live in North America, while about four-in-ten (41%) live in the Middle East and North Africa – almost all of them in Israel. 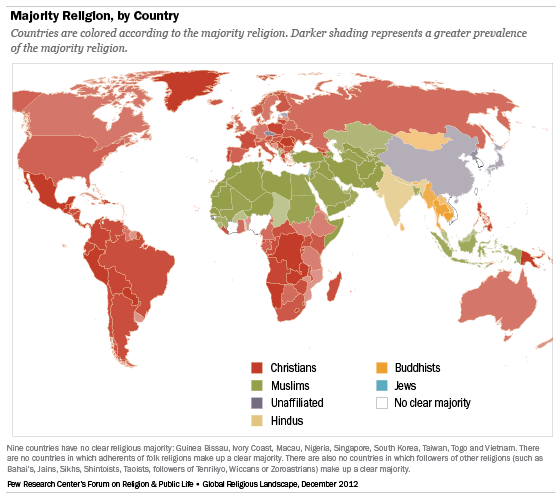 Most members of the other major religious groups live in countries in which they are in the minority. Seven-in-ten Buddhists (72%), for example, live as religious minorities. Just three-in-ten (28%) live in the seven countries where Buddhists are in the majority: Bhutan, Burma (Myanmar), Cambodia, Laos, Mongolia, Sri Lanka and Thailand. 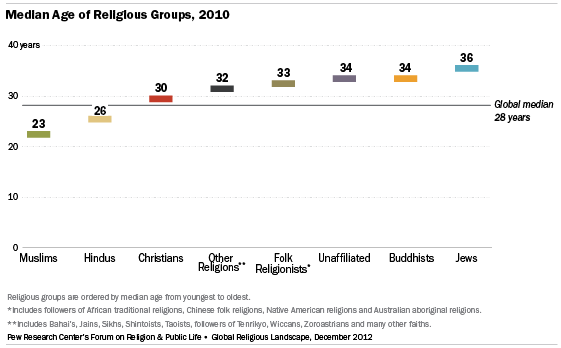 Some religions have much younger populations, on average, than others. In part, the age differences reflect the geographic distribution of religious groups. Those with a large share of adherents in fast-growing, developing countries tend to have younger populations. Those concentrated in China and in advanced industrial countries, where population growth is slower, tend to be older. The median age of two major groups – Muslims (23 years) and Hindus (26) – is younger than the median age of the world’s overall population (28).3 All the other groups are older than the global median. Christians have a median age of 30, followed by members of other religions (32), adherents of folk or traditional religions (33), the religiously unaffiliated (34) and Buddhists (34). Jews have the highest median age (36), more than a dozen years older than the youngest group, Muslims. These are among the key findings of a new study of the global religious landscape conducted by the Pew Forum on Religion & Public Life as part of the Pew-Templeton Global Religious Futures project, which analyzes religious change and its impact on societies around the world. For estimates of the religious composition of individual countries, see Religious Composition by Country table. For details on the methodology used to produce estimates of religious populations in 232 countries and territories, see Appendix A. For a list of data sources by country, see Appendix B. To see each country’s and territory’s population broken down by number and percentage into the eight major religious groups in the study, see the sortable tables at http://features.pewforum.org/grl/population-number.php. This study is based on self-identification. It seeks to estimate the number of people around the world who view themselves as belonging to various religious groups. It does not attempt to measure the degree to which members of these groups actively practice their faiths or how religious they are. To discuss the geographic distribution of religious groups, this report divides the world into six major regions: Asia and the Pacific, Europe, Latin America and the Caribbean, the Middle East and North Africa, North America and sub-Saharan Africa. For a list of countries in each region, see the Methodology.